Size and speed, the Scots present maybe the toughest game on the schedule, Olu will be the other right after. 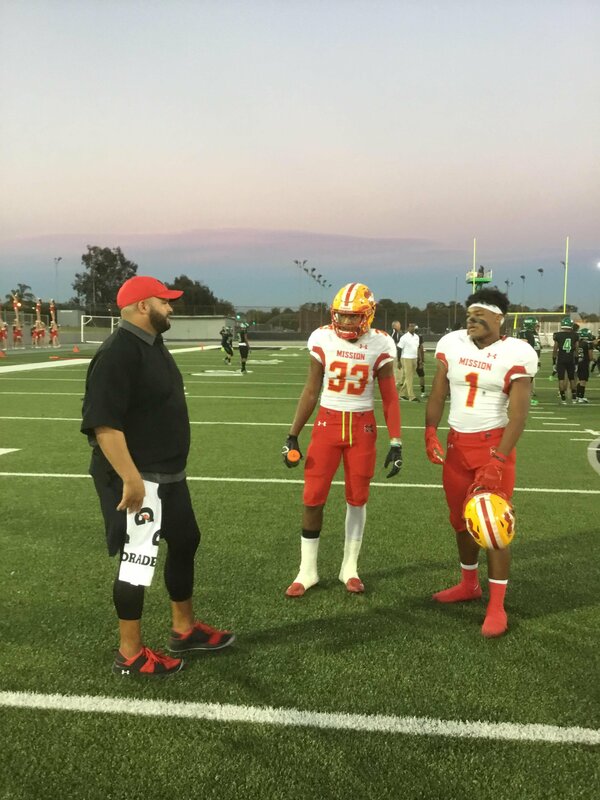 Had a chance to speak with DC prior to the Spartan game and his eyes got big when Upland was mentioned...two of the top 3-4 publics will be playing each other with 3-0 records against common and quality opponents. MV will have to clean it up, new players learning their assignments, still making to many mistakes, penalties too frequent. Reece Hite played his first game of season Friday night, Easton maturing quickly and brings a truckload. Syrr Barnes should be back, kid is a run stopper! That said MV seems to be playing just above oppnent level and has not been threatened yet this year. A solid win for MV will boost rankings and will mark the season. You do know he’s committed to Purdue, right? Just not sure he has the decision making and consistent accuracy needed to win a starting D1 QB job. MV vs Upland is gonna be a good one. Are the Diablos on the road? The U seems to thrive at Home. Both of these teams have good skill guys, big strong trench guys , good special teams. Upland does a great job of mixing up the offense, lining up in various sets. Yellen is the better of the two at QB. Upland has some guys, on offense, 23, 3, 4, 5,2 and MV is matching that with 2, 6. Uplands D loves to blitz and Justin Flowe # 10 is the real deal. I expect a lot of screens and hot passes, but Yellen does a good job of getting rid of it quick . Uplands DB # 3 is the guy, I would attack # 4. A lot of man no deep help. Go get this for the OC MV! Right now Calpreps has MV a 2 point fave... 22-20. Only from some of the commentary on here do I give Upland the edge and home field won't hurt..
Yellen in 4 games is 80 comp for 121 attempts ,1167 yds with 10 TD and 0 ints. with at least 6 td called back for holding, and at least 5 just plainly dropped. He has been outstanding so far. MV has run the ball 82 times for 414 yds. Arnold has had 4 TDs called back ( 1 in each game) so far. He also has 5 int in 4 games. 31 compl in 47 attempt for 408 yards 3 TD and 1 int. Upland most likely will have the plan to run the ball effectively to try to control the clock and tempo of the game to keep MV offense off the field. Yes, MV looks to be solid and heavier on the pass 121 attempts vs 81.run. Interesting take Hit the Lights. This should be a good game. There is a reason however that people don't throw at #4 Manly on Upland. He is a 6'2 Cal Commit that will make you pay. The Corner on the other side is 6'3 #2 Zambrano and also very good. Had a nice pick 6 vs REV. The way I see it They have a common opponent in La Habra that finished with almost the same score for each team. The difference between playing Upland and playing La Habra is Upland has a lot more at linebacker than just #10 Flowe. #11 Thornton, #9 Floyd, and #44 Little Flowe fly around the field. It should be a great Game which will be televised also. 28-10 Upland. If the Upland team that showed up to play against La Mirada last week shows up to play Mission Viejo then Diablos win by at least 3 TD's. It was 7-7 at the half. Take away the 2 punt return TD's by Upland it's only a 21-7 game. La Mirada ran their Matadore Ole offense for the 2nd week in a row. That is....OL step aside and let the DL come right in. No doubt Upland has some guys but MV will make you pay if you don't play at your highest level. Thnx scj60 I am now officially back on the MV side after that game report! scj60 wrote: If the Upland team that showed up to play against La Mirada last week shows up to play Mission Viejo then Diablos win by at least 3 TD's. It was 7-7 at the half. Take away the 2 punt return TD's by Upland it's only a 21-7 game. La Mirada ran their Matadore Ole offense for the 2nd week in a row. That is....OL step aside and let the DL come right in. I have to completely agree with you there. UHS came out completely flat in the first half. Then took over the game in the 3rd. The most surprising part was the 1st half was over before 8pm. I have never been through a first half of high school football that fast. If Upland Comes out vs the Diablos like that it will be a quick night for the Scots. I think Upland will come ready for some high powered football. And for all you OC guys your "Max Preps All American" Boop made an appearance in the 4th QTR. He went 1 play for a quick interception and out. That Gives him 4 drives for 1 fumble, 1 Int, and two punts while producing -7 yards in total Offense on the season. In fairness MV is not playing that well either. If one of teams plays to their potential and the other doesn't it could be ugly either way. Hopefully MV plays well. Upland is especially tough at home. Hopefully its a great game by both teams. I think it will be close either way. The same. 23 and 3 and 10 are the best players on that team. I'm sure Johnson will see that on film. Upland does have good team speed and much better than Calabasas up front. MV might have the edge there and as a total unit. Penalties and turnovers could be the death of them if they don't get that squared away. Should be a good game. from what you all are saying it looks like the winner will be whoever makes the least amount of mistakes and should be whoever wins between Uplands running attack and MV's passing. Uplands QB also has the ability to scramble and has a few TD's on the Ground. #23 Davis is the more Fluid back who carries most of the load but they will also see plenty of #5 Ford who is the power back at 5'10 240. It should be a great game. Is everyone going to be playing for MV? Particulary LB Syrr? Almost everyone healthy and good week of practice, kids are buying in, defense was dominant, MV can pound it, Marvin Anderson with a couple big catches, Sophmores did really good tonight, Jacquez Robertson, Easton Mascarenas, Marvin Anderson, Ryder Fitch in secondary. Good win! Prep for Olu starts tomorrow...23 and 25 are just fun to watch Jacquez is a mini Earl Camble...41-8 good win for the Diablos! Backers Coach, 12 yrs NFL, Coach Thomas with Syrr Barnes and Easton Mascarenas...These dudes can Ball!